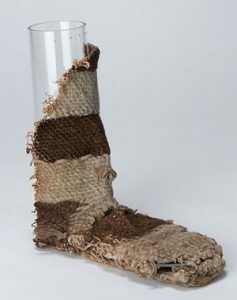 Pueblo people (sometimes called the Anasazi) started to build mud-brick houses for themselves in the south-west part of North America (modern Colorado, northern Arizona, and New Mexico) about 100 BC, during the Middle Woodland period (the time of the Han dynasty in China, and the Roman republic in Europe). At this point archaeologists call them the Basket Maker people. Basket Maker people built houses of wooden poles and mud-brick, often dug into pits in the ground, or they lived in caves, which were easy to find among the sandstone cliffs. People hunted and gathered most of their food, but by 1 AD they also grew pumpkins and corn, which they had learned about from Maya people to their south. 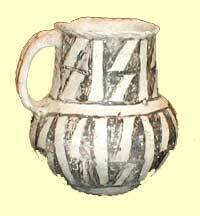 They did not use pottery (even though Maya people did), but mainly baskets. Around 500 or 600 AD, people in this area also learned how to grow beans. They also domesticated turkeys (or maybe got domesticated turkeys from Maya people). Then it got easier for them to get their food from farming and herding turkeys than from hunting and gathering. So Pueblo people mostly became farmers. Now that they were settled down, Pueblo women started to make pottery to keep their stuff in instead of baskets. By 700 AD these people began to build big apartment houses out of mud-brick and sometimes out of stone. People’s houses became much bigger than they had been before. They built their houses up on top of high cliffs called mesas. We call these houses pueblos, and we say they are made out of adobe, but those are the Spanish words for these things. In Hopi, a mountain is “tuukwi”, and houses are “kiho”. 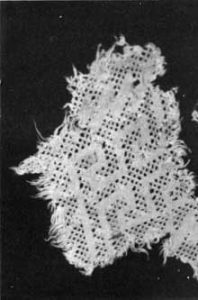 People also started to grow cotton for clothing, and their pottery got more complicated and had more different shapes like jugs, jars, plates, bowls, and cups. Pueblo people got rich and powerful, and spread out to take over more land as far north as central Utah and southern Colorado, and as far south as a good part of Mexico. Pueblo traders were selling their turquoise for pretty parrot feathers and other things which came from as far away as the Maya in Central America. Rich people made capes and headdresses out of the feathers. They also traded for cocoa beans, to make into chocolate sauces and hot cocoa drinks. Because there wasn’t much wood where they lived, they learned from the Aztecs to their south to burn coal for fuel. There are four main groups of Pueblo people, who all spoke different languages – they are the Zuni, the Hopi, the Tanoans, and the Keresans. The Hopi language was related to Ute and to Aztec. The South-west is very dry, and so people needed to be careful to get every last bit of water they could find. They built systems of dams and stone cisterns to store water from melting snow up in the mountains. This was not just for drinking water, but also they needed water to irrigate their corn and beans and pumpkins so they would grow. 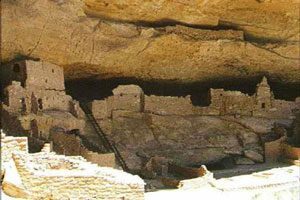 Around 1200 AD, Pueblo people stopped living on top of the mesas and they moved to pueblos (houses) that were built half-way up the cliffs, in caves. Nobody knows why they decided to move to these caves. Maybe the weather got too hot and it was cooler in the caves. Maybe they were fighting wars and they needed to be in a safer place. But some people also moved back to the mesa tops – some people think this was safer than the cliffs. It’s possible that Ute, Paiute, and Shoshone people invaded Pueblo land at this time. But around 1300 AD, Pueblo people stopped building houses altogether and moved away from their homes. Probably they moved because a global cooling trend meant that the weather became too dry, and people couldn’t farm corn and beans there anymore. They lost all their power, and they stopped living in their fine houses, and they stopped farming. They traveled south-west, into southern Arizona and New Mexico, looking for new homes. That’s when the Pueblo people first met the Navajo and the Apache, who were moving south into Arizona and New Mexico about the same time, for the same reason. by Alice Flanagan (1998). A good choice for younger kids. Mother Earth, Father Sky: Pueblo Indians of the American Southwest, by David Lavender (1998). A lot on the Anasazi and then a little about the Pueblos near the end. The Pueblo: Farmers of the Southwest, by Jane Duden (2000). First history and then a substantial section about Pueblo people today. Cite this page: Carr, K.E. 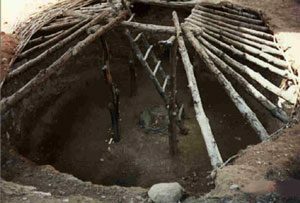 Pueblo history – Anasazi – Native Americans. Quatr.us Study Guides, August 9, 2017. Web. April 25, 2019.